As part of a professional exchange with their Cambodian counterparts, U.S. Navy physical therapists provided services directly to patients at a local physical rehabilitation clinic as part of Pacific Partnership 2014, June 23. The Pacific Partnership nursing team is providing a practical demonstration of interoperability with eight days of professional and practical exchanges with Cambodian medical professionals, with both sides taking away tangible information. 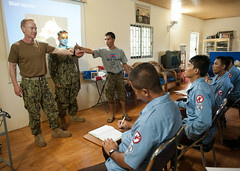 U.S. Navy undersea medical specialists taught basic life support techniques to Cambodian deminers June 22 as part of Pacific Partnership 2014. 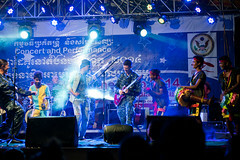 With a song on their lips and instruments in their hands, U.S. Pacific Fleet Band musicians made their first appearances for Pacific Partnership 2014 in Cambodia, performing twice in one day June 21 for the children and people of Sihanoukville. 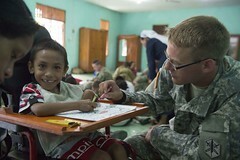 As part of Pacific Partnership (PP14) 2014, service members from Australia, New Zealand and the U.S. visited children at the Irmas Alma School for the Disabled, June 20. 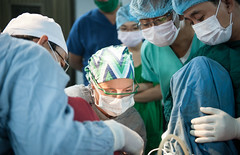 U.S. Navy surgeons perform multiple surgeries alongside Cambodian physicians June 20 at the Preah Ket Mealea Hospital in Phnom Penh as part of Pacific Partnership 2014. 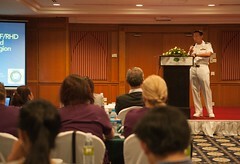 U.S. Navy physicians participating in this year's Pacific Partnership mission led a rheumatic heart disease awareness symposium in Phnom Penh, June 20. 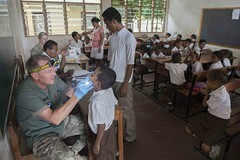 In an effort to promote strong relations and enhance community wellness, members of the multinational dental team currently supporting Pacific Partnership (PP14) 2014, worked tirelessly with the local communities of Kupang, Indonesia, and Dili, Timor-Leste. 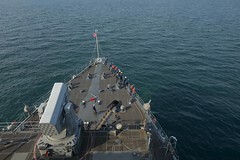 The amphibious dock landing ship departed Kuantan, Malaysia, June 19 after participating in the amphibious phase of exercise Cooperation Afloat Readiness and Training (CARAT) Malaysia 2014. 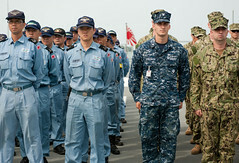 The Japan Maritime Self-Defense Force’s JS Kunisaki (LST 4003) arrived in Sihanoukville June 19, carrying a multinational crew of U.S., Australian and Japanese personnel for Pacific Partnership 2014.